On January 4, 1800, the Law Society of Upper Canada's first Treasurer, John White, died from wounds he suffered in a duel the day before. An English lawyer, White was appointed Attorney General of Upper Canada in December 1791, and he traveled to Canada in the spring of the following year. 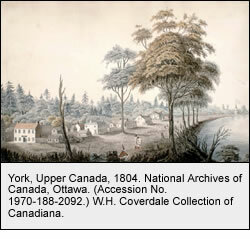 He settled briefly at Kingston, then Newark (now Niagara-on-the-Lake), and finally in 1797 in York (now Toronto), to which the capital had been moved. Officials considered York less likely to fall to the Americans if they invaded the colony than Newark, which was too close to the border. As Attorney General, John White bore the responsibility for transferring British laws to the colony. At the founding meeting of the Law Society in Newark in May 1797, White was named first Treasurer, a position he held for one year. However, what remains of his diary and correspondence sheds little light on those responsibilities. In his diary, White recorded little more than his social engagements and in his letters home to friends and family, he complained - about his finances, his wife, his health, the backwardness of the colony, the settlers, the Americans, the costs of construction, the weather, and the lack of "rational" society. In a letter to his brother-in-law in Nov. 1796, White described himself as "Banished, solitary, hopeless, planted in the desert … disappointed - and without prospect…." Matters only got worse. After a social exchange that culminated in White insulting Mrs. Small, wife of the Clerk of the Executive Council, her husband, seeking to defend his wife's honour, challenged White to a duel. On the evening of January 2 nd , the night before the duel was to take place, White wrote to a friend: "Being obliged to meet Mr. Small tomorrow the Event of which no man can tell … let me implore your present protection to my family." At the duel the following morning, Small shot White through the ribs, and White lingered in excruciating pain for thirty-six hours before dying on the evening of Jan. 4 th . In his entry in the Dictionary of Canadian Biography it is noted that White is "now chiefly remembered for the circumstances of his death." 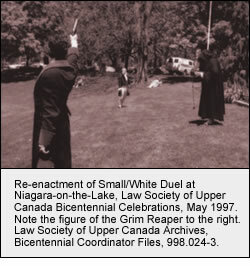 The Law Society's bicentennial celebrations in 1997 included a re-enactment of the duel, first in the celebrations at Niagara-on-the-Lake, and again on the front lawn of Osgoode Hall in Toronto. If he could talk, no doubt John White would still be complaining. Note on sources: The Law Society of Ontario Archives contains a photocopy of John White's diary (June 1792-April 1794), PF137. White's letters are housed in the National Archives of Canada, White and Shepherd Family fonds, R6473-0-6-E: quotations here are from White to Samuel Shepherd, 23 Nov. 1796; White to Peter Russell, 2 Jan. 1800. Biographical sketch by Edith Firth, Dictionary of Canadian Biography , v. 4, pp. 766-7.